The crowdfunded Tado Smart AC Control (formerly Tado Cooling) was supposed to arrive in August 2014, so today's launch marks the end of a long stretch of frustration for its more than 1600 Kickstarter backers. It also marks the beginning of a new phase for Tado, the German company best known for its Nest-like smart thermostat. Now that the device is finally here, the firm seems to have a new spring in its step: It's targeting an installed base of 100,000 units in New York alone by next June. 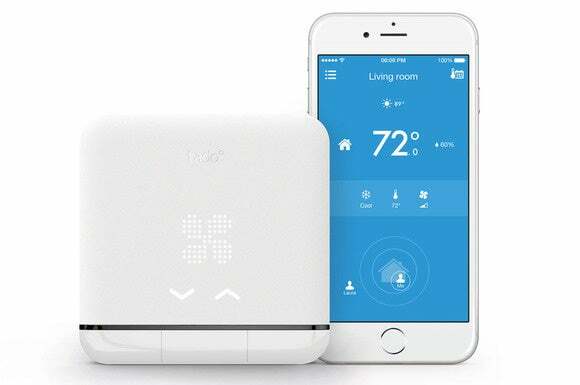 The $199 device works with any remote-controlled air conditioner, enabling it to be controlled remotely by an Android- or iOS-running smartphone (a Windows Phone app is in the cards, as is future support for Apple's HomeKit). Programming Smart AC Control for this purpose is as easy as pointing your AC’s existing infrared remote control at the device and pressing a few buttons. It communicates with your AC unit over an optical infrared link and connects to the Internet via Wi-Fi. While a single Smart AC Control unit can be used to control multiple ACs, they must all be in one room. A large part of Smart AC Control’s intelligence lies in being able to operate your air-conditioning unit for you while also lowering your energy bill. The location-aware device can automatically switch off your AC when you leave your house, and pre-cool your room just as you’re about to return. Built-in sensors help ensure the temperature and humidity inside your room are to your liking. Interestingly, it also packs sensors for light, motion, and noise, but the company says not all of them are usable at this stage. The impact on you at home: You can accomplish something similar with the Nest Learning Thermostat, provided you have central air conditioning. But in case you have a home with standalone ACs—be they in-window, wall-mounted, or portable—you’ll need something like the Tado Smart AC Control. Correction: Tado reached out to inform us that it began shipping the first Smart AC Control devices to Kickstarter backers in February, but that procurement and manufacturing issues temporarily reduced its ability to fill orders. That means Sensibo was not first to market, as we previously reported.